At Kaiser Permanente there are many patients who are sub-clinical but are feeling distress. They wanted to understand what would be more convenient and provide more options for people, and understand from therapists where they send people who are sub-clinical (and how to provide them with more options). They interviewed 38 members and heard their symptoms and emotions. They determined that they needed to create something highly accessible, and offer them apps – things you can use at 4am. There needs to be video, audio, and articles. And there needs to be engagement. Engagement is often 1-3%. That’s not good enough. They wanted more, measured in multiple ways. At KP, they care about health literacy. They’re evidence-based, but they know that many treatments are based on white populations, and the KP population is much broader than that. They needed to understand how life differs in different lifestyles, and Project Chamai is creating ways to improve the capacity to obtain, process, and understand basic health information. They’re moving beyond the white caucasian population. 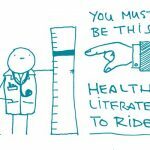 What does Health Literacy Mean for Members? Patients want to feel better, faster, in a way that works for them. So KP listened to patients. But they can’t just listen to them – the healthcare system is risk averse, and speaking colloquially feels risky. You’re risking the impartial voice and thus people’s trust. The decision is we’re trying to solve: how might we support members with tools and resources that fit their real lives in ways that feel appropriate and authentic as trusted expert providers of care? Don’t pathologize. Patients don’t use clinical terms, so we don’t need to either. They’re concerned about symptoms, not diagnoses. Contextualize offerings to members’ real lives and experiences. If they have five minutes for themselves in the morning, don’t recommend an app to track movement all day. Offer an app for a few minutes of yoga first thing in the morning. Speak the language. Wellness language can be off-putting and cause people to shut down. Work with companies already set-up to share information in colloquial ways. This means vetting organizations on multiple levels – not just what they’re offering, but how they’re committed and what they believe. The end goal? Creating multiple doors to healthcare.